Your choice of style. Served with hot garlic bread and your choice of side. Small rings of pasta filled with your choice of beef or cheese. Served with hot garlic bread and your choice of side. Macaroni pasta‏ baked with mozzarella cheese. Served with hot garlic bread and your choice of side. With your choice of sauce. Served with hot garlic bread and your choice of side. Served with hot garlic bread and your choice of side. Filled with your choice of chicken, beef, cheese or portobello mushrooms. Served with hot garlic bread and your choice of side. With your‏ choice of sauce. Served with hot garlic bread and your choice of side. Vegetarian or‏ with meat. Served with hot garlic bread and your choice of side. Chicken sauteed in marsala wine with mushrooms and lightly sprinkled with parsley. Served with vegetables and spaghetti on the side. Includes garlic bread and your choice of side. Breaded veal cutlet tenderized and sauteed, then baked with marinara and mozzarella cheese. Served with vegetables and spaghetti on the side. Includes garlic bread and your choice of side. Breaded skinless chicken breast baked with marinara sauce and mozzarella cheese. Served with vegetables and spaghetti on the side. Includes garlic bread and your choice of side. Fresh basil pesto sauced served over your choice of spaghetti, linguine, rigatoni, mostaccioli or fettuccine with cut chicken breast. Includes garlic bread and your choice of side. Baked in marinara sauce and mozzarella cheese, served with vegetables and spaghetti on the side. Includes garlic bread and your choice of side. Low-calorie. Made with fresh tomatoes, mushrooms, eggplant, garlic, sweet basil and lemon juice. Includes garlic bread and your choice of side. Breaded jumbo shrimp sauteed and then baked with marinara sauce and mozzarella cheese. Includes garlic bread and your choice of side. Veal sauteed in marsala wine with mushrooms and lightly sprinkled with parsley. Served with vegetables and spaghetti on the side. Includes garlic bread and your choice of side. Cut chicken breast sauteed with onions, red peppers and green peppers. Topped with mozzarella cheese and served with vegetables and spaghetti on the side. Includes garlic bread and your choice of side. Cut chicken breast lightly sauteed with red and green peppers, red onions and garlic, then mixed with fettuccine in a cream sauce with a touch of tequila. Includes garlic bread and your choice of side. The food was a bit bland. It tasted like they poured a can of tomato sauce on the pasta. They were not busy, but the service was lacking. Saw this on-line and wanted to add my review. Once again it didn't disappoint. We came last year and again this weekend and it was awesome and delicious. Always a great meal. Don't understand the "closed" hours status. It's open for business! Peroni on tap too! Family and I love dining here or getting our food to go. The restaurant is owned by a wonderful family. Food and service is always fantastic. 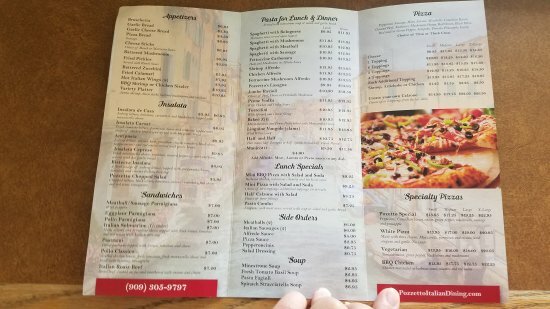 Delicious Italian food with a nice wine menu. We enjoyed a nice dinner here during our visit to California. Family owned and operated. Service was excellent and staff very friendly and helpful. Small, cozy atmosphere. Very good food. Would definitely go back. Nice place in San Dimas center. Got a pizza to go. It was average as was the price. They made it pretty quickly. The crust was of medium thickness. Decent selection of wines too. Very good food only complaint is service is a little slow, but we keep going back.. Wine and beer served. San Dimas is a quiet little town and very friendly. Get quick answers from Pozzetto Italian Dining staff and past visitors.